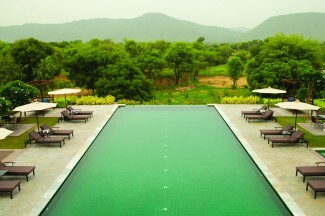 Looming over the sparse Bishangarh Village in Jaipur, Alila Fort Bishangarh is perfectly situated – only a three hour drive from Delhi and one hour away from Jaipur. This ancient relic has beautifully morphed from a 230 year old abandoned warrior fort into one of India’s most exotic heritage properties. Standing regally atop a granite hillock encompassed by the undulating Aravallis, Alila Fort Bishangarh rises like a mythical giant. 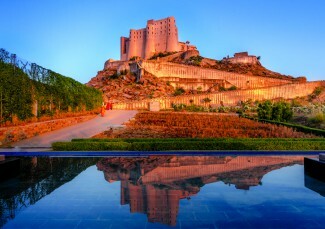 Standing regally atop a granite hillock encompassed by the undulating Aravallis, Alila Fort Bishangarh rises like a mythical giant above the village havelis and fields. The seamless amalgamation of a traditional structure with modern culture and design has brought this decrepit royal outpost into the 21st century. Many parts of the old structure were restored and still stand like the entrance gate to the fort. This historic monument is a blend of Jaipur Gharana architecture, shaped by both the Mughals and the British. Jaipur based architects, Sthapatya designed the royal residences with much care given to the ecological restoration. 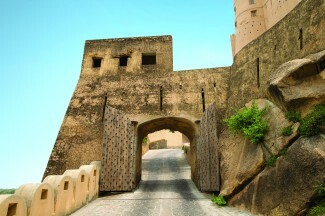 The resort still features the fort’s original two-meter-thick walls and its battlement turrets and arches, while a completely new structure has been constructed above and outside to accommodate five different styles of royal suites and lavish communal areas. The grand arrival tent at the resort has been peppered with furniture to look like a haveli. Winding down its circumference, across a small path is the airy tented arrival courtyard, the serene pool and terrace, a juice bar, gym, kids’ club and lush lawns – by far the best place to admire the fort! 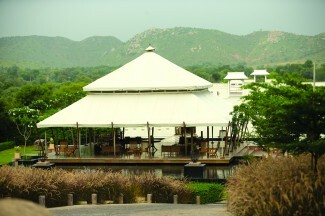 The azure pool is by far the best place to drink in the surroundings and admire the fort. 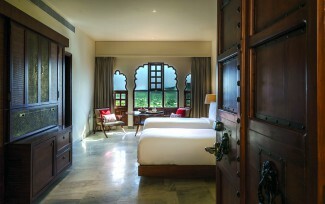 Over the duration of its remodelling, the soul of the fort has been passionately brought to life, recreating the opulent flavour of Shahpura’s royalty without overpowering its stark simplicity. Architect Sandeep Khandelwal’s primary tasks were to stabilise and buttress the dilapidated ruins before creating a road to the fort, finding circulation through the building and unravelling the conundrum of this free flowing curved structure that did not have a single 90 degree wall! The facade was restored with a mix of mortar and local stone dust to appear time worn, while 59 unique suites were carved out conforming to the curvature and gradient of the existing turrets. Rooms and even restaurants were scaled to accommodate the former layout, while damaged facets were restored, notable features replicated and found objects re-purposed. Fifty-nine unique suites have been carved out conforming to the curvature and gradient of existing turrets. All the windows, entrance portals, arches, columns, railings, jaali screens, turrets and walls were made to look like the original. Rather than creating an ornate palace, as might be expected of a Rajasthani estate, the design direction is decidedly spartan, marked by clean uncluttered interiors judiciously woven with traditional elements – Jharokha-style windows, stone Jaali work, brass embossed panels, Tarkashi (the craft of brass wire designs inlaid in wood), hand block printed fabric and wall frescoes with Thikri mirror work. Local marble, granite, carpets, fabrics, artefacts, lighting and furniture all contribute to its authenticity. All the rooms have been handsomely bedecked with enormous bay windows, cozy day-beds, sumptuous linens, large bathrooms with footed tubs, all overlooking picture perfect panoramas. 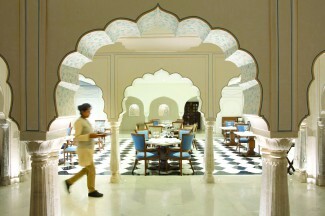 Rajput and Tudor architecture harmoniously blend together at the main restaurant Amarsar. The once princely residences of the fort now house the main restaurant Amarsar, named after the birthplace of the Shekhawat clan. Interior designer, Ritu Khandelwal embraced elements of Jaipur Gharana architecture, married with Rajput and Mughal influences to create the perfect exemplification where Tudor and cusped arches harmoniously dot the premises. The walls in Amarsar have been finished with a blend of traditional Surkhi (stone dust) and glittering Araish work (Rajasthani plastering art), while 30,000 sq. ft of the fort has been covered in marble and the rest finished in local sandstone. Turrets, cellars and hidden passages have been amazingly modified into bars, lounges, and dining areas. Nazaara, sits atop the fort walls with unending views of the landscape, while Madhuveni a cigar lounge, housed in a turret, its thick stone openings that once brandished muskets have been kept open to improve air circulation. 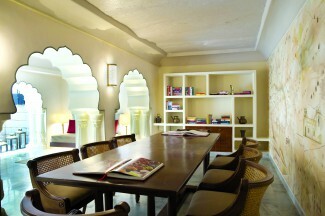 The Kachhawa Lounge, that was part of a secret escape route now revels in the 4 Cs – champagne, coffee, chai and cakes! The library, which is housed under scalloped arches displays a map of the ancient kingdom. The library, arranged between scalloped arches displays a map that depicts the ancient kingdom, while Spa Alila, carved out between granite rocks in the old dungeon is relaxing yet echoes its unforgettable past. Guests can now experience something entirely novel as the fort begins its new legacy… a stunning melding of Alila’s hallmark principles; innovative design and luxury set in a one-of-a-kind location!